Decision Making is perhaps the most important area when it comes to XAT preparation. 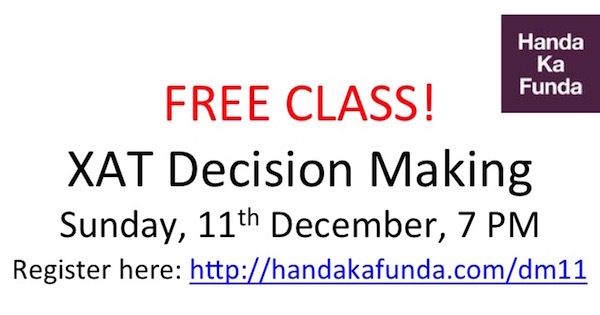 Questions on Decision Making have been asked in XAT for quite a few years. However, their importance has gone up drastically since 2012. Before that, you could expect 8 to 10 questions on Decision Making in the Analytical Reasoning section. In 2012, Decision Making became a section of its own and if you were to look at it purely from a scoring perspective – it make the most important topic for a student who is planning to write the XAT. It so happened because Quantitative Aptitude, Data Interpretation, Logical Reasoning and Verbal Ability – none of them had a full section on their own. They had to share the limelight, so to say, with some other related topic. In 2012, there were 25 questions in the Decision Making section. It even had some questions that were of 1.5 marks instead of the standard 1. The XAT paper in 2013 also had 25 questions, although all questions were of 1 mark each. The XAT paper in 2014 had 21 questions, and XAT 2015 exam had 24 questions in the Decision Making section. These kind of questions require a logical approach and a clear understanding of the situation. It often requires going through large amounts of text and then logically interpreting the information presented. To put it in conventional terms, it is a combination of Reading Comprehension and Logical Reasoning and traditionally students who are good in these two areas tend to do well in the Decision Making section as well. A good way to prepare for Decision Making would be to look at previous year papers. You can have a look at questions from XAT 2008 to XAT 2016 which would give you approximately 150 questions to practice. These 150 questions will not only tell you your current level of understanding of the topic but if you analyze them properly, it can really make a difference to you final score. Indian Institute of Research is a Government-established body to promote research. In addition to helping in policy making, it also provides free online access to all the articles to the public. It has a mission of publishing high quality research articles. Till 2010, the publication of articles was very slow because there was no incentive for researchers to publish. Researchers stuck to the mandatory one article a year. Most of the researchers engaged in offering consultancy and earned extra income. Since its inception, the institute was considered the best place for cutting edge research. The new director of the institute was not happy with the work done by researchers in silo and came out with a new research policy in 2013 to increase research output and improve collaboration among researchers. It was decided that extra benefits would be offered to researchers with new publications. As a result, the number of research articles increased fourfold in 2014. At the 2015 annual audit, an objection was raised against the new benefits scheme. Auditors were not happy with increased expenses towards remuneration for researchers. Further, the Government opined that the publication was itself a reward and hence researchers need be paid nothing extra. The director tried to defend his policy but the response from the government was not encouraging. Note: Auditors role is to verify accounts. 1. The following facts were observed by an analytics team hired by the government to study the extant situation. 1. There was a four-fold increase in the number of researchers leaving the organization in 2014. 2. A researcher died while on duty. 3. The quality of articles published declined substantially. 4. The average number of people accessing an article decreased by 2%. Which of the following options would justify the government’s intention to DISCONTINUE the scheme? Exp: Fact 1 cannot be the reason as a substantial increase in attrition is irrelevant for the government to take a decision regarding the quality of the scheme. Fact 2 cannot be the reason as one researcher could have died because of other reasons. Fact 4 cannot be the reason as 2% decrease is not substantial enough. Hence the only possible answer is fact3 making C as right choice. 1. Most famous researchers in the world are also the highest paid. 2. American institute of research gives extra benefits to its scientists. 3. This year’s highest paid researcher had won the Nobel Prize last year. Considering the Government to be reasonable which of the following options is UNLIKELY to convince the Government? Exp: Those most famous researchers are also paid high does not imply that the highest paid researchers are always famous or that they will be productive. If an American Institute is giving extra benefits it does not mean IIR should also follow it. The researcher may be getting the highest pay as a consequence of receiving the Nobel Prize, or there may be other reasons for the researcher to be highest paid. Hence E is the correct option. 1. Auditors need not be allowed to object to extra benefits schemes. 2. Auditors need not pin-point sudden increase in expenditure. 3. Auditors need not be consulted before taking any policy level decision. Which of the following combination of options should the director agree THE MOST with? Exp: As given in note 1 of the caselet, the auditor’s role is to verify accounts and not to make policies. The Director and other top officials are the best people to decide on policy related matters. As points 1 and 3 are policy related, D is the correct answer. Kamal Chinnappa, Vimal Rao, Ganesh Krishnan and Dinesh Kumar own a saloon each on the Barbil street. They are the only hairdressers on that street. Each of them offered three services viz. haircut, shaving and hair-dye. One evening, all four of them met in a nearby tea stall and agreed to charge ₹100 for any of the three services (haircut, shave and hair-dye) on weekdays. They also agreed to increase this rate to ₹115 on weekends and holidays. All verbally decided to implement the agreement. 4. The following day Kamal, being the most competent hairdresser on the street, was contemplating charging higher than agreed upon price. Which of the following would enable him to charge more with minimal violation of the agreement? A. He should introduce a new and specialized service at ₹130. B. He should open another shop on the same street and charge ₹150. C. He should charge ₹130 for those wanting to jump the queue. D. He should charge ₹115 for a service to a particular customer and give the next service free. E. He should open his shop two hours before others and close it two hours after. In B he is in violation of the agreement since the agreement was between people and not the shops. C and E is wrong since charging more for jumping the queue and extending work hours may increase revenue but will not enable him to showcase his competence (which is his objective). D is a wrong answer since giving free service is a violation of the agreement. 5. Vimal relies heavily on a bunch of loyal customers. He is concerned about retaining them. Which of the following options should he choose if he does not want to violate the agreement? A. He should charge differential rates for loyal customers. B. He should charge the loyal customers lower. C. He should make every third visit free for his loyal customers. D. He should charge all the agreed upon price. E. He should allow his loyal customers to jump the queue. Exp: A, B and C will end in violation of the agreement. C because the price per visit comes down by one third. D does not violate but does not solve the problem of retaining the loyal customers. The correct answer hence is E where the customers get a preference but pay the same. The City of Yashmund is served by licensed taxis operating on officially sanctioned metered rates and driven by licensed drivers who do not own the taxis but pay a monthly rent to the taxi-owners. Shaliesh Nair, the mayor of Yashmund, perceived that most of these taxis do not offer sufficient comfort and safety to passengers. 6. The Mayor wants the owners and drivers to care about comfort. Which of the following decisions, IF TAKEN, is MOST LIKELY to increase the comfort levels of passengers? A. The mayor issues a guideline that taxis will be randomly inspected by the police for the comfort level. B. The mayor ensures banks grant drivers loans to own cars. Owner driven cars generally offer greater comfort. C. The mayor introduces licensing of air-conditioned taxis which can charge increased rates to the rich customers. D. The mayor introduces a feedback system that records passenger satisfaction with comfort levels; this will affect renewal of annual taxi license. E. The mayor permits doubling metered rates which will ensure enhanced income for owners to invest in greater comfort. Exp: A does not imply any punishment and therefore may not induce the drivers to care about comfort. B may not be taken up by the drivers if they are satisfied with the rents they currently receive and hence is not correct. C focuses on a specific market segment and may not solve the problem for the entire market. E does not ensure that the extra amount will be invested in comfort. D focuses on a measure of comfort and a penalty for lack of comfort based on the measure and hence is the correct answer. 7. The mayor wants to involve the car owners in finding a solution to the problem of comfort and safety. He is concerned that the customers may not be willing to pay more for safety. Which of the options below is MOST LIKELY to convince the owners? A. The taxi owners who clear comfort-inspection can charge higher rentals from the drivers and drivers with impeccable safety record can charge the same from customers. B. The taxis that clear comfort-inspection can charge 25% above the metered rates; studies have shown that customers are willing to pay around 18% extra for comfort. C. If a taxi owner has a consistent record of comfort and safety the government will subsidize a second loan. D. Taxis can charge 25% more if they clear comfort-inspection. However, owners of the taxis found compromising on safety will be jailed. E. Taxis that pass comfort-inspection test can charge 25% more. Should they violate any traffic rule this privilege would be withdrawn. Exp: The customers are likely to pay more for comfort and not for safety. Taxi owners can be motivated to provide more comfort by allowing them to charge more, but only strong penalties would prevent safety violations. Only D addresses both safety and comfort concerns and therefore is the right answer. Option B and E focus on comfort but ignore safety (violation of traffic rule is only one aspect of safety rule). Moreover, option E penalizes safety rule breakers by only denying the use of comfort related privilege. Penalty should be more with safety rule violation.Option C does not penalize safety violation. Moreover, the taxi owners may not require a second loan. Option A is wrong since customers are not willing to pay more for safety. Bhowmick, a budding politician with hordes of money. However, his clean image along with Ghosh’s money ensured Chatterjee’s resounding victory. 8. After the elections, Ghosh requested Chatterjee to sanction the land adjoining his factory, for expansion. However, the requested government land was a green belt reducing harmful pollution from the factory. Which of the following is the BEST option for Chatterjee in these circumstances? A. Chatterjee should approve the sale only after Ghosh plants a large number of trees around the factory and the city. B. Chatterjee should oblige Ghosh provided he recruits 20 locals as his employees on condition that they plant and maintain a tree each in their locality. C. As Ghosh is paying market rates Chatterjee should approve the sale with no riders. D. Chatterjee should approve the sale and ensure that the green belt is shifted to a different tract of land outside the city, purchased from the proceeds of the sale. E. Chatterjee should unconditionally approve the transfer of the land to Ghosh as a token of gratitude. Exp: E and C are wrong as they do not take care of Chatterjee’s duty to the city. B is wrong since the locals and not Ghosh are made responsible for the greenery; moreover the 20 30 trees in their respective locality may not be sufficient or even relevant to reduce pollution. D is wrong since Chatterjee is taking the responsibility to buy land from the proceeds of the sale and Ghosh gets the land with no riders (similar to C). A ensures that Ghosh first plants a stipulated number of trees and that too around the factory and the city, hence A is the right answer. 9. Inspired by Bhowmick’s manifesto, Chatterjee is contemplating a green policy which can adversely affect Ghosh’s business interests. Which of the following actions from Ghosh is likely to convince Chatterjee NOT to pursue this policy? A. Request Chatterjee to defer implementation of the green policy by 3 years, the time needed to make his factory green. B. Remind Chatterjee that it is for his clean image that people voted him and not for Bhowmick’s green policy. C. Warn Chatterjee that all industrialists will turn against him and despite his clean image he may be hated by the industry. D. Appeal to Chatterjee’s sympathy citing the potential loss his business will suffer if the policy were to be implemented. E. Threaten Chatterjee that he should not take his loyalty for granted as Bhowmick has invited him to join his party. Exp: Chatterjee may not pursue the green policy unless his future interests are protected. Option A will not convince Chatterjee as it will not affect his future interests. Moreover, Policy framed in favour of his friend makes it unethical. Option C is unfounded assumption and hence is wrong. D may gain Ghosh some sympathy but it is not going to convince Chatterjee. E may affect Chatterjee, but it might backfire on Ghosh too. B appeals to Chatterjee’s stakeholders and hence is the right answer. Nicky, Manoj and Benita are graduates from a top ranked B-school. They joined ABC corporation a year ago. ABC is known for its performance oriented culture. This is the first time the organization recruited from a top ranked B-school. They are part of a five member team with two others from lower ranked B-schools. Nicky, Manoj and Benita draw 40 per cent higher salaries than other team members. This team reports to Amelia Ganeshmurthi, a senior executive. 1. Fire them from ABC for insincerity and save the organization’s time and money. 2. Give them average ratings with a year to prove their worth and fire them from ABC if they fail to show significant progress. 3. Impose a pay-cut of 15% since they have not delivered on the promise, but give them relatively high ratings. 4. Give them relatively poor ratings with one year time to improve and fire them from ABC if they fail to show significant progress. 5. Give them high ratings and give them a second chance to prove their worth. Which of the following options rank the above choices in the order of MOST APPROPRIATE to LEAST APPROPRIATE? Exp: Action 1 is the third best and better than action 5 in which they get very high ratings for performance in a performance oriented organization. Action 2 is the second best action since the trio gets average ratings instead of less than average ratings for their poor performance. Action 3 is the worst decision because this action sends mixed signals. Amelia is giving high ratings and simultaneously cutting salary. Action 4 is the best action because poor rating reflects the poor performance of the trio in tune with the performance orientation of the organization while giving the trio enough time to improve. Action 5: The organization is right in giving them an opportunity but rating them high is wrong. This decision is better than action 3 since the communication is clearer and does not send any mixed signal. Option C is in sync with the above logic and therefore is the correct answer. 11. Recruiting Nicky, Manoj and Benita was part of a larger initiative to make the organization attractive to prospective employees. Recently Amelia’s boss informally told her that the trio’s perception of the organization might influence future recruitment from top B-schools. However, the trio had already expressed their unhappiness about the organization to Amelia. She suspected that her promotion due next year might depend on the trio! Which of the following is the BEST way for Amelia to deal with this situation? A. Henceforth, she should be lenient with the trio. B. She should promise the trio an early promotion if they can help her recruit good talent from top B-schools. C. Henceforth, she should occasionally invite the trio for dinner and informal outings. D. She should tell her boss that it is unfair to link her promotion to the trio’s behaviour. E. She should convey the trio’s unhappiness to her boss. Exp: Ms Amelia “suspects” that the trio could affect her promotion. She should clear this suspicion by communicating the opinions of the trio to her boss. This will result in her boss reviewing his/her expectations from the trio and therefore also from Ms Amelia. Therefore E is the correct answer. Options A, B and C do not serve the interests of the organization.While option A and option C might serve Ms Amelia’s short term interests. Option D is wrong since it is her own perception and unfounded. 1. Inform the higher authorities about Nicky’s poor performance and ask them to take a call. 2. Send Nicky for a one month training earmarked for top performing employees. 3. Serve Nicky an ultimatum to improve within the next six months or get fired. 4. Even though they performed well, give Manoj and Benita average ratings because of their disinterest in helping outside workplace. 5. Give Manoj and Benita high ratings based on their performance. Which of the following combination of above options will be the MOST APPROPRIATE? Exp: ABC is a performance focused organization, punishing poor performance and rewarding good. Among the combination of decisions that are appropriate for the given situation, one decision from 1, 2 and 3 and one from 4 and 5 have to be chosen (1, 2 and 3 are about Nicky and 4 and 5 are about Manoj and Benita). Action 1: Amelia is running away from her responsibility with this action. Action 2: This decision rewards Nicky for non-performance. Action 3: Amelia is asking Nicky to focus on performance and gives her an ultimatum. This is a better decision compared to the actions 1 and 2. Action 4: This decision is wrong because Amelia is punishing Manoj and Benita for their behavior outside workplace. Action 5: This decision rewards Manoj and Benita for their performance and is the right thing to do. Based on this rationale, the best combination would be 3 and 5 .Therefore Option E is the right answer. Recently a private food testing agency reported the presence of a harmful chemical in Crunchy Chips, a product of a fast moving consumer goods giant. The report sparked a nationwide outcry. 1. Apologizing publicly for this inconvenience and immediately withdrawing the products from all stores. 2. Communicate ‘the correct findings’ to the public. 3. Hire a reputed independent testing agency to verify the claims of the report. 4. Establish internal mechanisms to prevent repetition of such incidences in future. 5. Give higher incentives to distributors and retailers for selling the company brands. Which of the following would be the MOST APPROPRIATE ORDER of options for Rajan, starting from the immediate? Exp: Veracity of leaked report has not yet been ascertained. It may be a good idea to first check the credibility of the report through an independent agency. Based on these findings a concrete action can be taken. Therefore 3 followed by 2 is the correct order. Therefore B is the correct answer. 1. Sell the entire stock at a discount before the news spreads. 2. Destroy the entire stock and advise customers not to buy this product from other shops as well. 3. Donate the entire stock of Crunchy Chips to a local orphanage. 4. Inform customers about the controversy but understate its seriousness. 5. Ignore the news and sell the stock at the forthcoming festive season as planned. 6. Explore the veracity of the report and then take decision. If arranged from ethical to unethical which of the following is DEFINITELY the WRONG order? Exp: Actions 1, 3, and 5 are unethical because Mukesh is capitalizing on information he is privy to. Action 4 is also unethical but to a lesser extent compared to 1, 3 and 5 though he is informing the consumers he is deliberately “understating the seriousness”. Whereas action 2 is ethical, 6 is not unethical. 1, 3 and 5 are all unethical with no definite ranking among them. This rules out Option A, C, D and E.
Option B is definitely a wrong order and hence the correct answer. 15. An independent and trustworthy confidante of Rajan Shekhawat, the CEO of the company, informed him that one of their main competitors had bribed the food testing agency to manipulate the report. Which of the following actions will BEST help Crunchy Chips to bounce back? A. Proclaim over the media that their product is completely safe. B. Secretly hire a food testing agency to ascertain the quality of the competitor’s product. C. Hire another food testing agency to test and communicate the outcome to the consumers. D. File a defamation case against the competitor for their alleged involvement in the conspiracy. E. File a defamation case against the food testing agency. Exp: The objective is to bounce back i.e. resurrect the damaged image of the company and dispel all the doubts about their products. The company should ensure that such incidents are not repeated. The root cause of the problem is that the testing agency engaged in an inappropriate action (whereas the agency was supposed to be fair and neutral) at the behest of the competitor and this should be nipped in the bud. Option A and C: The option does address the national outcry but does not address the proxy war by the competitor, which might recur. Option B: The decision is inappropriate and not addressing the problem at all. Option D: Their competitor is engaged in a proxy war. So, directly targeting the competitor will be a disaster. Option E: The decision is appropriate as it targets the testing agency and not the competitor. It also addresses the national outcry indirectly because only a brand confident of its product quality will file a defamation suit. This in a way reassures the consumer about the product quality. Therefore Option E is the correct answer. Purushottam Bhatnagar owns and operates a sweetshop Puru and Sons. He is about 60 years old and is eager to hand over the business to his sons Ratan and Pramod. He however, fears that his sons, fresh from college may not understand the tricks of the trade. 16. Purushottam sends a batch of sweets to the Police station across the street every day. Ratan construed it as a bribe and wanted to stop this practice. Which of the following arguments, IF TRUE, would BEST convince Ratan NOT to give up this practice? A. In the last three years, three attempts to burgle Puru and Sons were effectively foiled by the Police. B. Each policeman receives only two pieces of sweet, too small to be considered a bribe. C. The police in return send two policemen in mufti to mingle with the customers during rush hours to prevent pickpockets. D. Every day, Purushottam also sends a batch of sweets to the school next to the station, an orphanage nearby and the temple at the end of the street. E. Purushottam’s competitor Uttampurush who runs a sweetshop in the same street and his neighbour Mahapurush who runs a samosa stall, both do similar things every day. Exp: Option A and Option C are both wrong since in both cases Purushottam is “paying” the police for discharging their duties. Option B is wrong since the pettiness of the bribe cannot be a defence. Option E is wrong because you don’t become right just because others are also doing it. Option D is the best since Purushottam is sending a batch of sweets to many other social institutions and therefore can be argued as a goodwill gesture. Therefore Option D is the correct answer. 17. Purushottam’s eldest son discovered that the shop repackaged sweets that were close to expiry and sold them at a discount under different names. These sweets usually get sold very fast. But his son was concerned about the possible consequences of this practice. Purushottam was thinking of the following arguments to convince his son. 1. These sweets are consumed the same day and therefore there is no cause for worry. 2. Reduced prices give enough indication about the sweets to the customers. 3. These products are preferred by those who cannot afford full price and in a way, this is a service done to them. 4. In the past 30 years not a single person has reported ill because of consumption of these sweets. 5. Repackaging and selling sweets is a common practice. Which combination of arguments below is MOST LIKELY to convince Ratan? Exp: Statement 1 by itself is not a correct answer since “no cause of worry” is not supported by any evidence. This support comes from Statement 4. Therefore Statement 1 together with Statement 4 will convince Ratan. Therefore Option B is the right answer. 18. Purushottam’s younger son Pramod discovered that 10% of their customers whom Purushottam called privileged customers purchased sweets at prices fixed 10 years ago (which is significantly lower than the current prices). Purushottam told him, “This 10% are my core and loyal customers with whom I have personal connect and therefore they deserve this privilege”. Pramod refuted his father’s argument citing the following information. 1. These customers form the top 20% of the income bracket of the city. 2. These customers frequently purchase from other sweetshops at market prices. 3. None of them recognises and greets Purushottam at the shop or at anywhere else. 4. None of them was present at Pramod’s marriage. 5. These customers actually buy sweets at Puru and Sons for others not part of the core and loyal customer group. Which of the following combination of the above will MOST LIKELY convince Purushottam to charge market price to all? Exp: Option A is not correct since discount cannot be discontinued just because customers are in the top income bracket. Options B, D and E are not correct since not being present at one event cannot be used against them. Option C is the right answer since the customers do not seem to be loyal and are also taking advantage of the discount in an unfair manner, since this is a select discount only to the loyal customers. If you have any questions about the session, please let us know via comments or email us on [email protected] If you think some of your friends might be interested in attending this class as well, please share this post on Whatsapp / Facebook.